You can switch between two themes, light or dark. These themes change the appearance of the browser’s tab bar and the combined address and search bar. By default, Opera is set to light theme. To enable dark theme, click on Easy Setup in the right side of the toolbar and turn on Dark under Themes. You can change how your start page and other Opera pages appear by applying wallpapers. 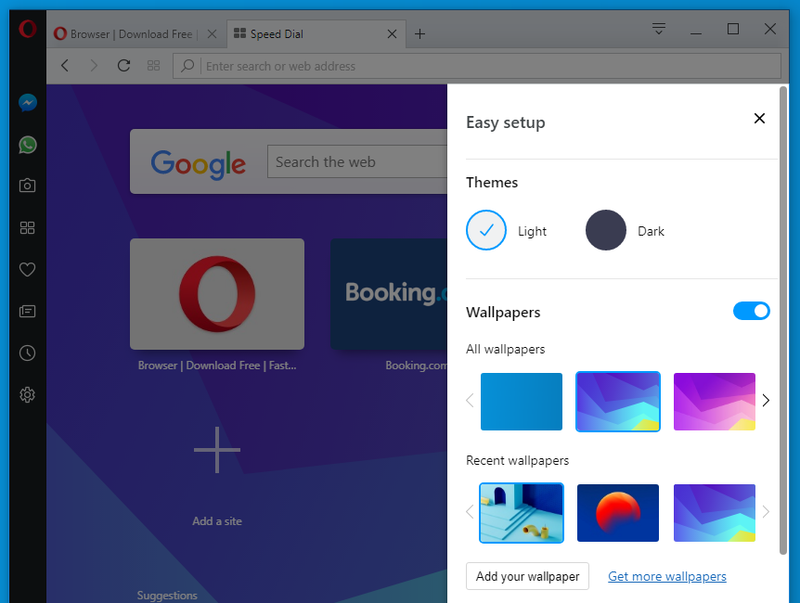 There are a few preloaded wallpapers in Opera, and you can find them in Settings > Wallpapers. You can also access wallpapers after clicking the Easy Setup button on the right side of the toolbar. Click on a wallpaper to change the look of your browser. Or, if you want to find more wallpapers, click the Get more wallpapers button to go to the wallpapers section of addons.opera.com/. From there, you can browse and install wallpapers created by the Opera community. The wallpapers you download from the site can be found under Settings > Wallpapers or from the Easy Setup menu. You can create a wallpaper from any image you find on the web. Ctrl+click (Mac) or right-click (Win/Lin) an image and select Use Image as Wallpaper. Under Wallpapers, click the Add your wallpaper button. Browse and select an image from your system. The image will become your new wallpaper and it will be added to your list of wallpapers. Extensions are tools and applications designed to give the Opera browser a variety of new capabilities, from protecting users from web threats to weather apps, online dictionaries and translators, developer tools, and much more. To manage your extensions, select View > Show Extensions on Mac, and O Menu > Extensions on Windows and Linux. You can also click the box icon in the sidebar from the start page. Click the Get more extensions link in the sidebar to go to the extensions section of addons.opera.com/. From there, you can browse and install extensions created by the Opera community. Some extensions will appear by default at the right side of the combined address and search bar. Click the extension icon to interact with it, or Ctrl+click (Mac) or right-click (Win/Lin) it to see more options in the extension manager. There are specialized sidebar extensions which can be accessed with the extensions bar. When enabled, this sidebar will remain present with you throughout your browsing session. To enable the extensions bar on Mac, select View > Show Extensions Bar. To enable it on Windows or Linux, go to O Menu > Extensions and select Extensions sidebar. Your sidebar extensions will be added to the extensions bar. If you wish to add more extensions, click the + button in the sidebar. To hide the extensions bar on Mac, select View > Hide Extensions Bar. On Windows and Linux, go to O Menu > Extensions and deselect Extensions sidebar. Opera is translated into many languages, making it easier for you to browse in your native language. Opera will use your system’s default language to set the browser’s language. Go to your Mac’s System Preferences. In the Preferred languages: box, click and drag a language to the top position. Refresh your browser to complete the change of language. Click next to a language and click Display Opera in this language. If you are switching from another browser and are now using Opera, you can import browsing data, including history, bookmarks, cookies, and more, from another browser. Under Synchronization, click Import bookmarks and settings. Choose a browser and which items to import. The imported browser data is found in your bookmarks page. You can import browser data from Google Chrome, Mozilla Firefox, Safari, Yandex, or from a bookmarks HTML file. Startup preferences allow you to tell Opera which page or set of pages should open when the browser is launched. Under Basic, go to On startup. Begin fresh with start page – Opera begins on the start page and with no open tabs from your previous browsing session when launched. Your pinned tabs remain pinned. Retain tabs from previous session – Opera resumes your previous browsing session when launched. All tabs left open when last using the browser will be open in your new browsing session. Open a specific page or a set of pages – Opera opens a page or a set of pages when launched. To add a page, click Add a new page, type the web page’s address, then click Add. You can add multiple pages. Or, you can choose from your currently open tabs by clicking Use current pages.